We're a leader in full color yard signs, banners, and more! 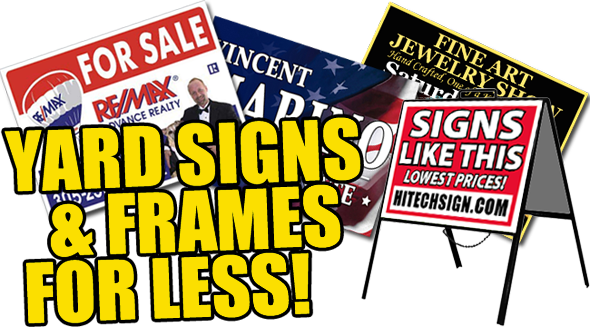 From "bandit signs" to yard signs to bench signs and mini-billboards, we do them all, we do them better, and we do them for less! We also sell high quality vinyl banners and magnetic signs, as well as sign stakes and frames! We're also an APPROVED SUPPLIER for many top business and real estate franchises! Spring has Sprung! ...and yard sign and banner season is here! Whether you're looking to promote a new business, super sale, or special event, we have an affordable sign or banner solution for you! And if our super-low prices aren't enough, right now we're also offering FREE SHIPPING ON EVERY ORDER! Take a look around our site, and if you have any questions or need something not shown here, call us anytime at (706) 234-2628 or email us at orders@hitechsign.com for immediate service.